In 2006 the United Nations (UN) established a new Human Rights Council (HRC) to be “responsible for the promotion and protection of all human rights around the globe.” The HRC replaced the Commission on Human Rights (CHR) after it had been heavily criticized for allowing countries with poor human rights records to be members. Now, ten years later, the upcoming vote by UN General Assembly members on Saudi Arabia’s continued membership on the Council will show whether or not the HRC is any different than its maligned predecessor. Since joining the HRC in 2014, Saudi Arabia has not only carried out gross and systematic human rights violations at home and abroad, it has also used its power in the Council to mask its own abuses, bully senior diplomats, and politicize humanitarian projects. At the end of October, Saudi Arabia will run for a second term on the Council. For States that profess to care about promoting human rights and safeguarding the integrity of international institutions, voting against Saudi Arabia is the only option. It is no secret Saudi Arabia’s values are at odds with the HRC. Religious intolerance, gender inequality, and a penchant for public executions are hardly the qualities that the UN had in mind for its Council members. Additionally, while the ways in which Saudi Arabia conducts its domestic affairs provide compelling arguments against Saudi Arabia’s reelection, it is Saudi Arabia’s actions in Yemen over the past 18 months, coupled with its denials and cover-ups, that are an affront to the very essence of HRC’s mission. After Houthi forces toppled the Saudi-allied government in March 2015, Saudi Arabia’s King Salman began what was expected to be a limited military campaign in Yemen. However, the Saudi intervention has ballooned into relentless aerial assault, with little to show but the loss of civilian life. Amnesty and Human Rights Watch have identified 69 unlawful air strikes by the Saudi-led coalition, some of which may amount to war crimes, that have killed at least 913 civilians. In addition to the indiscriminate air campaign, the coalition’s strict naval blockade has prevented Yemenis from receiving desperately needed aid. As a result,twenty million Yemenis, nearly 80% of the population, are in urgent need of food, water, and medical aid. Instead of working with the UN to alleviate the affects of its campaign, Saudi diplomats are working hard to cover them up. Earlier this summer, Saudi Arabia successfully blackmailed the UN into removing its name from a list of violators of children’s rights by threatening to cut UN funding. While the removal sparked international outrage, it was only the latest in a series of Saudi manipulations of UN officials. Last September, at a session of the HRC in Geneva, Saudi Arabia and its allies successfully defeated a Dutch resolution for an independent inquiry into the Yemen conflict. Such an inquiry was sorely needed, especially since two months into the intervention in Yemen UN officials banned foreign journalists and human rights workers from its flights into and out of the (increasingly isolated) country. 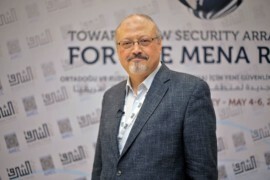 UN officials and aid workers, speaking on condition of anonymity, said the ban was instituted after the Saudis rejected a flight manifest that included reporters from the New York Times, BBC, and other journalists. The HRC was established to promote human rights and hold violators accountable. Saudi Arabia’s presence on the Council turns HRC’s mission on its head. If Council members vote to allow Saudi Arabia to remain for a second term, they will become increasingly complicit in the very violations that the Council seeks to eradicate.